Step 1 In a small pan, heat the milk over medium heat just until warmed. Remove from heat and pour the milk into a small bowl or measuring cup. Stir in the yeast and 1 teaspoon sugar, then set aside until the yeast is activated and the milk is foamy, about 10 minutes. Step 2 Whisk two of the eggs in the bowl of a stand mixer with the whisk attachment (or in a large bowl with a hand mixer) until light and fluffy, about 1 minute. Stir in the yeast mixture and remaining sugar until fully incorporated. Step 3With the mixer running, add the butter, one or two pieces at a time, until all of it has been incorporated. Step 4In a medium bowl, whisk together 3 cups of the bread flour and the salt. With the mixer running, add the flour mixture, a spoonful at a time, until all of it has been incorporated into the dough. Step 5Remove the dough to a lightly floured surface and knead until it is soft and elastic with a silky texture, 5 to 7 minutes. Knead in additional bread flour as needed, up to the remaining one-half cup. Place the dough in a lightly oiled bowl and loosely cover with plastic wrap. Set aside in a warm place until doubled in size, 1 to 1 1/2 hours. Step 6While the dough is rising, cook the bacon in a large skillet over medium heat until the fat is rendered and the bacon is crisp, about 15 minutes. Stir frequently so the bacon cooks evenly and does not stick to the bottom of the pan. Remove from the heat and drain the bacon on a paper towel-lined plate, reserving one-fourth cup of the grease for the remainder of the recipe. Step 7Peel and core the apples, and slice each into eight pieces. Cut each slice crosswise into one-eighth-inch pieces. Step 8In a large skillet, melt 2 tablespoons bacon grease over medium heat. Stir in the apple slices and cinnamon and cook for 2 minutes, stirring frequently. Stir in 2 tablespoons maple syrup and continue to cook, stirring frequently, until crisp-tender, another 2 minutes. Remove the pan from heat and stir in the amaretto. Place the pan back over medium heat and cook until the liqueur is mostly absorbed, about 1 minute, stirring to scrape any bits of flavoring from the bottom of the pan. Remove from heat and set aside to cool. Step 9When the dough is doubled, punch it down and roll it out on a lightly floured surface into a 12-by-18-inch rectangle. Spread the apples and bacon bits evenly over the dough. In Recipes-list.com we have selected the most viewed recipes from category - Breads Breakfasts . Enjoy the best recipes specially selected for you! 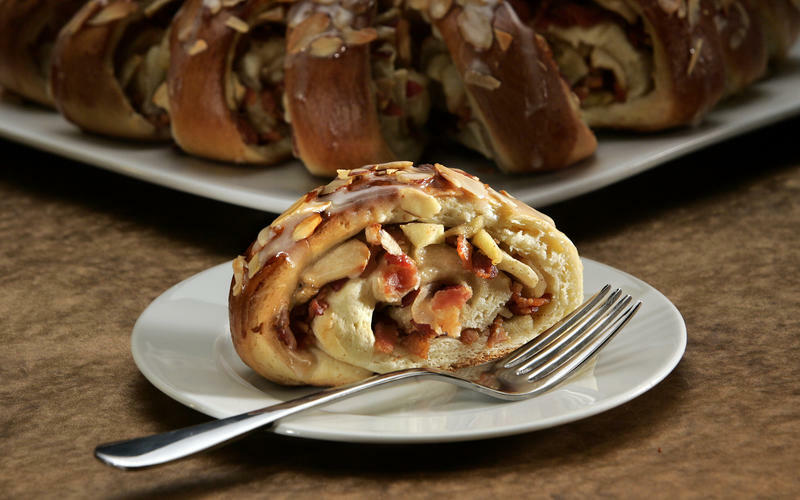 Apple bacon coffeecake is the right choice that will satisfy all your claims.